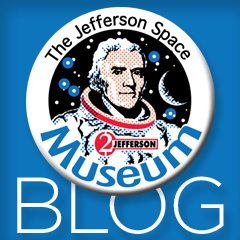 Welcome to the new Jefferson Space Museum website! Designed by our good friend Doug Eymer at Eymer Brand Laboratories + Think Tank. So, poke around on the new site - check it out. And don't forget to stop at the gift shop! The blog has been on hold for a while since we've decided to update the site...but with the new site and new infrastructure, we'll be posting here more often!